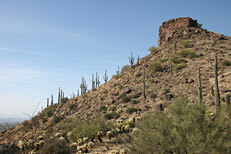 This hike was a 5 mile clockwise loop hike in the Northern Region of Scottsdale's McDowell Sonoran Preserve using the Upper Ranch, Brown's Mountain and Brown's Ranch Road trails. 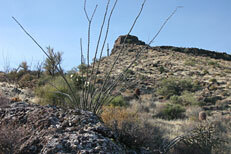 South side of Brown's Mountain from Upper Ranch Trail. 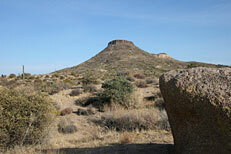 Brown's Mountain from Upper Ranch Trail. 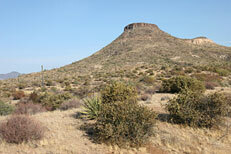 Cone Mountain from Upper Ranch Trail. 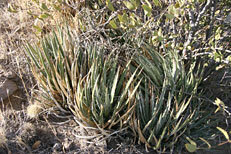 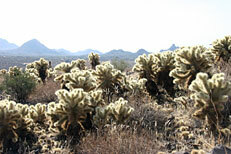 The cactus in left foreground is Buckhorn Cholla (Cylindropuntia acanthocarpa) and the yucca to the right is Banana Yucca (Yucca baccata). 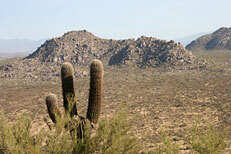 Saguaro Cactus (Carnegiea gigantea) frame Cone Mountain from Upper Ranch Trail. 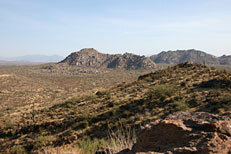 A view Cholla Mountain and Granite Mountain across the desert from Brown's Mountain Trail. 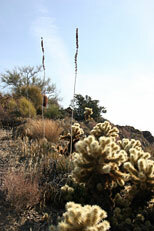 Wands of Ocotillo (Fouquieria splendens) reach skyward with on the slopes of Brown's Mountain..
California Barrel Cactus (Ferocactus cylindraceus) among (Agave toumeyana). 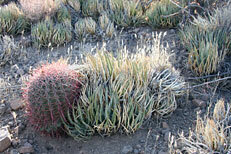 (Agave toumeyana) and Teddy Bear Cholla (Cylindropuntia bigelovii). 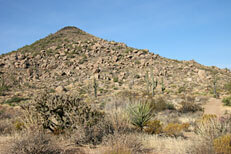 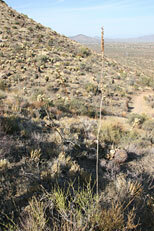 Saguaro Cactus (Carnegiea gigantea) surveys Cholla Mountain and the desert scene below. 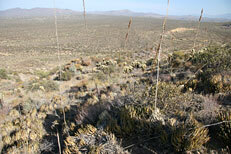 A view across the desert through (Agave toumeyana) stalks. 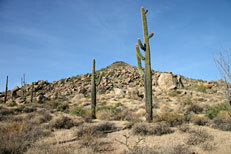 Saguaro Cactus (Carnegiea gigantea) line the slopes of Brown's Mountain. 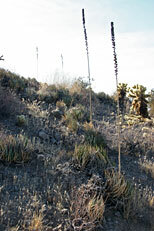 Ocotillo (Fouquieria splendens) canes rise above Teddy Bear Cholla (Cylindropuntia bigelovii). 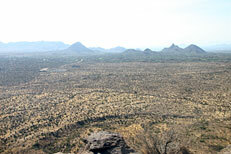 View to the south from the summit of Brown's Mountain with Pinnacle Peak on the right. 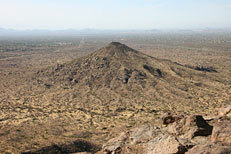 Cone Mountain from the summit of Brown's Mountain. 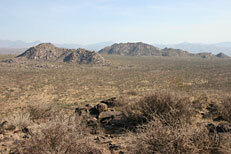 Cholla Mountain and Granite Mountain from the summit of Brown's Mountain. 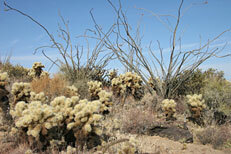 Teddy Bear Cholla (Cylindropuntia bigelovii). 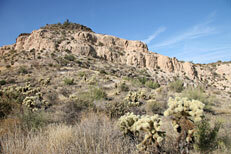 Volcanic tuff on the east flank of Brown's Mountain. 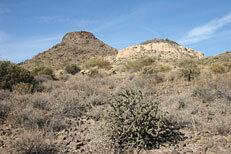 Brown's Mountain is a composed of a layer of volcanic basalt along with a layer of volcanic tuff (the lighter colored layer on the right). 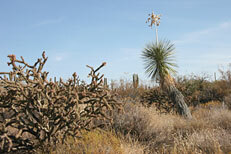 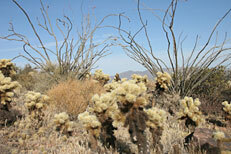 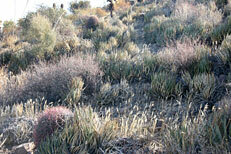 Buckhorn Cholla (Cylindropuntia acanthocarpa) on the left and Soaptree Yucca (Yucca elata) on the right.